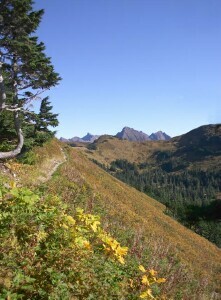 Harbor Mountain Road provides the only vehicle access to the alpine in Southeast Alaska. It was built during World War II to provide access for military emplacements near the top. Currently a picnic area and the trailhead for Harbor Mountian Trail are accessible via the road. There are 3 gates along the road that may be closed to passenger vehicles when snow and ice warrant. When the snow pack is sufficient, the road and upper alpine areas are opened to use by ATVs and snowmobiles. The road gains about 2000 feet of elevation from the base of the mountain to the end. The trail gains an addition 1100+ feet to the Summit of Harbor Mountain. Trails to the picnic area are in good condition. Most of Harbor Mountain Trail is in moderate to good condition with the exception of the spur to the summit which is in poor. Drive out Halibut Point Road until you see the signs for Harbor Mountain via Kramer Avenue. Turn right (just before the Channel Club) and follow the road up as far as it is open (6 miles to the top). Excellent views of Mt. Edgecumbe and Sitka Sound from various points along the road and trail. A relatively short hike up the bowl provides an overlook of Sitka. The sub-alpine and alpine habitats are easily accessible via Harbor Mountain Road.